The release is cause for celebration amongst Purple fans due to the rarity of material. Extensive interviews with keyboardist Jon Lord and bassist Glenn Hughes tell the tale of a band caught by circumstance into one of its most controversial, extreme and exciting eras of its long career. 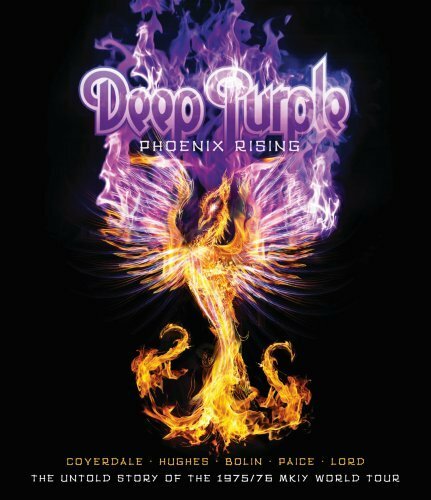 New York, NY (June 16, 2011)—On June 28, Eagle Rock Entertainment will release Deep Purple's Phoenix Rising – a two-hour-plus revelatory documentary including 30 minutes of never-before-seen (not even on bootleg) onstage footage from Japan. Phoenix Rising will be released on DVD, Blu-ray, and in a special two-disc DVD/CD package [Pre-book Order Date June 3, MSRP $19.98 for DVD/CD, $14.98 for DVD, and 19.98 for Blu-ray]. The release is cause for celebration amongst Purple fans due to the rarity of material. Extensive interviews with keyboardist Jon Lord and bassist Glenn Hughes tell the tale of a band caught by circumstance into one of its most controversial, extreme and exciting eras of its long career. Ian Gillan and Roger Glover were gone. A young unknown singer by the name of David Coverdale was recruited as was bassist Hughes. The results were the albums Burn and Stormbringer (both released in 1974). But then Ritchie Blackmore left the band. Against all odds, they rocked on, recruiting Tommy Bolin (from Zephyr and The James Gang). The album Come Taste The Band (1975) documents the short-lived Bolin era, an era that all came crashing down when the band announced in July of 1976 that it was breaking up. By December, Bolin would be dead due to a heroin overdose. Nine years of silence would ensue. The never-before-seen 30 minutes, Rises Over Japan, has the Coverdale/Lord/Bolin/Hughes/Paice lineup delivering the goods in 1976 on eight songs: Burn, Getting Tighter, Love Child, Smoke On The Water, Lazy, Homeward Strut, You Keep On Moving and Stormbringer. (The double-disc package contains these eight songs on CD.) This segment is some of the only video footage that showcases Tommy Bolin performing in Deep Purple. The 90-minute documentary portion, Getting Tighter, recounts the trials and tribulations of a band in turmoil, riding the rock'n'roll roller coaster to total excess. With its live images, backstage footage, never-before-told stories and original video material carefully culled from years of research, it's a veritable bonanza for Purple fans and fans of Rock History. No stone is left unturned...and sometimes it's not pretty. Gritty, truthful, wild, this is the story of an era in the 1970s that is simply unforgettable.